sausage, barbecue sauce, and fried onions. Lawrence Peter once said "The noblest of all dogs is the hot-dog, it feeds the hand that bites it." Indeed I'm constantly surveying my counterparts for their gastronomic discoveries here in this new world of Brussels, but I'm often left speculating for how much they actually care to try something new. One individual ordered Chinese, something I have two blocks from my U.S. house, another complained of the mass-quantities of cheese used on everything here (I sadly completely disagree with this observation, there is not enough). Who doesn't like cheese? My room-mate has been on a budget of 3 Euros a day purchasing nothing but durums. When I mentioned my escapades into new foods, their reply was "I'll stick to the durums". Not that there's anything wrong with anything my friends are doing, and we all must explore this city in our own way, but without the exploration of food- that emotional, sensory adventure, how can you say you lived in Brussels? The interesting part, is there's a true lack of information out there on what's good, and what's rubbish. It could take a life-time to figure it all out. So back to HopDog. Why the name HopDog? Beer fermented sausages? I really don't know, though I can tell you they're out of this world. What was recommended to me as their specialty is their Crispy Barbecue. It leans a bit more towards ketchup than U.S. BBQ, but the combination of crunch and taste is absolutely out of this world. I'm told the bread is baked daily, and most all the ingredients are local. There's even vegetarian (not sure how) and organic options for my fellow woodchucks. It truly is a fun, fantastic concept with amazing food. Now if I can just convince the owner into making me a chili dog. Then I'd be in take-away heaven. 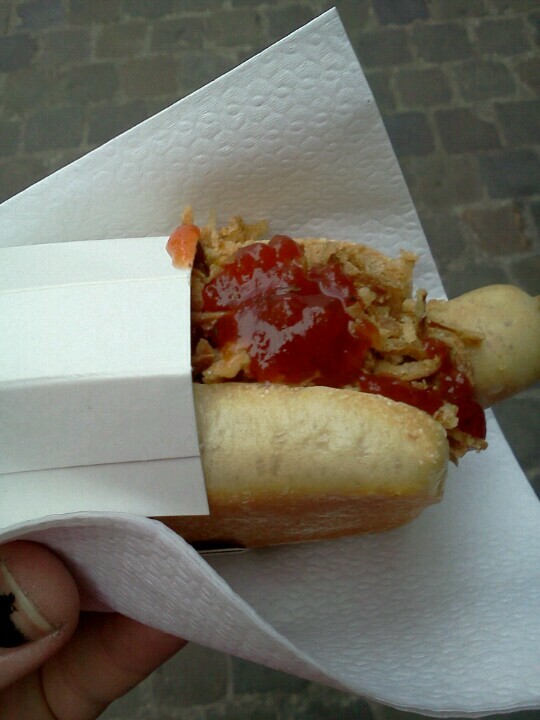 You should head over http://www.newyorkhotdog.be/ right now! I'm sure you'll be delighted by their famous Hot-Dogs they bring the New-York style to Brussels ! !